Okra originated from Egypt and Ethiopia where it grows wild. It is a traditional vegetable that is grown in the South. Five or six plants can produce enough for a small family. Okra will grow in almost any soil where the soil temperature is 60 F. It tolerates hot and humid summers. Plants should be grown in a warm areas and receive plenty of sunlight. Okra can be grown directly in the garden, but should be started indoors if you have a short growing season. Plant your seeds indoors 30 days before transplanting in the garden. 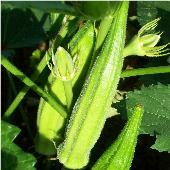 Okra is known for its poor germination rate, so plant sufficient amount of seeds. Keep weeded, but do not disturb roots. Plants can grow 2 to 8 ft tall. Requires fertile slightly alkaline soil in a well drained location in the garden. Apply much and grass clippings, or straw around base of plant. Does best if soil dries between watering. It can tolerate drought, but will not thrive in wet conditions. Use RootBlast, Vegetable Alive, and Slow Release Fertilizer when transplanting outdoors. Apply Miracle Gro every 2 weeks. Cut okra when pods are 2 - 4" in length or the pods may become tough.